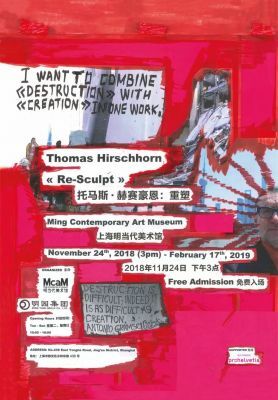 “Re-Sculpt” is the title of Thomas Hirschhorn’s first exhibition in China, which gives form to the fact-less and faceless truth by exploring the aesthetics of ruins and discusses the complexity and paradox of destruction and creation. “Re-Sculpt” is a never-ending work, a continuously developed and re-developed field. It invites and asks for the presence of every one of us to prove that: I am/we are as good in creation than in destruction. “Re-Sculpt” is the title, the vision and the mission of my new work for the McaM in Shanghai. “Re-Sculpt” means to give a new form, to give a new shape or to sculpt again, to sculpt differently. “Re-Sculpt” wants to create the conditions that provoke the essential questions: “Where do I stand? What do I want?”, “Why do I give the form I give?”. My ambition is that “Re-Sculpt” fulfills a dynamic questioning and addresses the visitor beyond: “Why?”, “Where?”, “When?” or “How was it done?”. “Re-Sculpt” wants to give form to a fact-less and faceless truth. The McaM-museum space will be made into a space of resistance, a resistance as such, a place without hierarchy. The exhibition areas will be turned into a landscape of ruins, - and this is my assertion of form - a universal and timeless space that presents an experience of precariousness and of porousness. The aesthetic of “Re-Sculpt” will be sculpted in borrowing from known pictures of destruction - destruction by violence, war, accident, nature, building-failures, corruption, or fatality. What interests me is the fact that every ruin - from ancient temples to today’s bankrupt industrial companies - tells us something, stands for something beyond its actual appearance. A ruin stands for a structural, economic, cultural, political or a human failure. (e.g. the ruins of the ancient Greek theater in Taormina Sicily, the ruins of Salvador Allende’s unfinished hospital project in Santiago, the ruins of factories in Detroit, the ruins of buildings bombed by the Israeli air force in the Gaza Strip). What interests me is that something in a state of “abandonment”, of “destruction”, of being “unused”, “no longer needed” or even “never finished” can resist the particular, beyond relevance to epoch or identity. To create destruction is an aesthetical challenge. To sculpt it - precarious, dense and charged is the challenge. To create a work beyond “the spectacular” means that the work must, by its aesthetic, give credit to the affirmation that only what touches the surface has a chance to reach profoundness. To touch the surface is the impact, “Re-Sculpt” wants to create an impact that touches the surface and extends under the surface. “Re-Sculpt” relates to the aesthetic of a “Potemkin village”, more precisely of an “inverted Potemkin village”. This means that the spaces are not rendered “better” than what they actual represent, but that their state shows in fact a “worse” situation than reality. This is why it is important that the ruins are “fake”, made from cardboard, tape, paint, polystyrene, paper, wood. In the “devastated” McaM-space, there will be two “shelters”. Two “shelters” of creation, and “shelters” of construction. These “shelters” offer a place - a workshop - for ‘production’ where something can be produced. In the workshops there will be material, the same as what was used for the landscape of ruins: polystyrene, cardboard, wood, paper, paint, with tools at disposal to work with. There will also be computers with Internet connection, printer, copy machine, tea water boiler. One of the“shelters”will be equipped with workbenches, tables, tools and shelves, to produce sculptures. The other “shelter” will have seats, books, drawing material, tea water boiler. The “shelters” will be run by a team working daily. Four people (two per workshop) will greet the visitors every day during the full exhibition time and will maintain the “shelter” spaces. They are the “guards”, the supervisors. They will lead the “shelter”-workshops from the beginning of the exhibition until its closing. This is their mission. Their task will be to explain that the workshops are meant to be used, that one can work and produce something here. They will assist the visitors who want to produce something in using the shelter; this production will remain in the workshop and belong to it as part of the exhibition until the end. At the end of “Re-Sculpt”everybody who wants can recuperate their production. Hanging from the ceiling in “Re-sculpt” there will be two quotes written on two banners, one of Chairman Mao in Chinese: “We are not only good in destroying an old world, we will also be good in constructing a new world”, and the other of Antonio Gramsci in English: “Destruction is difficult. It is - indeed - as difficult as creation”. These two quotes point the complexity and the paradox of creation, or construction, and destruction, they reflect the intricate dimension of the two terms – “creation” and “destruction” - that interact, communicate and interfere. “Destruction is difficult. It is indeed as difficult as creation”, Antonio Gramsci’s quote contains a non-corruptible and non-negotiable will to survive - and this is where “precariousness”stands. Antonio Gramsci expresses the contradictions of today’s world and our difficulty to reach its reality. “We are not only good in destroying an old world, we will also be good in constructing a new world”, the quote of Chairman Mao challenges our ideas about the old and the past and our capacity for creation of something new and different, both as acts of emancipation. Both quotes are not about separating or opposing “creation” and “destruction”, but about the difficulty of positioning oneself in the midst of a moving world, and the challenge of confronting the world’s reality between “creation” and “destruction”. The contact, the dialogue and conflict between destruction (“fake” ruins) and creation (“shelter” workshops) is the guideline of my work. Destruction and creation at the same time, simultaneous and linked. Something is being built with a ruin, creation happens within chaos. And it is not: destruction first, followed by construction or rebuilding. In the “shelter” workshops, “nonsense” can be produced. Therefore, the issue is not about “nonsense” against or in opposition to “sense”. The question is rather about asking what does “meaningful” or “nonsense” mean, and give a new highlight to the problematic of sense or meaning. “Nothing added” is my artistic-guideline for “Re-Sculpt” in order to give form to this work - not literally or anecdotally - but in the sense of working without extra material or without adding intellectual or physical implication and effort. Nothing is added, and nothing is supplemented means that everything given the visitor to see, to touch, comes from an “idea” of disaster and destruction. “Re-Sculpt” as a form, shows that a part - an important part of its entirety - has been cut off, as for example, when facades of entire history were obliterated. Therefore, if nothing is added, something is cut off, it creates a huge damage, even if there was no collapse. “Re-Sculpt” shows something, a building or history, that remains standing, that is faceless, and behind the structure, it offers a new view, making inside parts obvious, “hidden spaces” visible. The normally hidden connections shine brightly. The past breaks through, forgotten parts of history come to daylight again. This is the gift or the chance for something to come out and reveal itself within destruction. “Re-Sculpt” is an artistic assertion. The assertion - following Gramsci - that to give a form to destruction is difficult, to give a form to ruin is the problem and to give a form to disaster is the aesthetical challenge. Creating destruction is difficult - to me as artist - because it means that removing things, destroying things, demolishing things start in the mind, as an “idea”, as a guideline, as an artistic logic. It is to understand as an artistic gesture which allows changing everything. I must prove/we must prove - that I am/we are as good in creation as in destruction.